10 A None No Power Seat 10 A is a standard angle lie-flat Premium Laurel seat, although close proximity to the galley and lavatory may be bothersome. 10 C None No Power Seat 10 C is a standard angle lie-flat Premium Laurel seat, although close proximity to the galley and lavatory may be bothersome. 10 D None No Power Seat 10 D is a standard angle lie-flat Premium Laurel seat, although close proximity to the galley and lavatory may be bothersome. 10 G None No Power Seat 10 G is a standard angle lie-flat Premium Laurel seat, although close proximity to the galley may be bothersome. 10 H None No Power Seat 10 H is a standard angle lie-flat Premium Laurel seat, although close proximity to the galley may be bothersome. 10 K None No Power Seat 10 K is a standard angle lie-flat Premium Laurel seat, although close proximity to the galley may be bothersome. 20 A None No Power Seat 20 A has extra space due to the exit row, though some of your legroom is impeded by the slide that protrudes from the exit door and you may have to angle your legs to fully stretch them. The proximity of the galley may be bothersome and people often congregate in this area during flight. The tray table is in the armrest, making the armrest immovable and slightly reducing seat width. There is no floor storage for this seat during takeoff and landing. 20 C None No Power Seat 20 C has extra space due to the exit row. The proximity of the galley may be bothersome and people often congregate in this area during flight. The flight attendant seat is directly across from this seat and you'll have to share your foot space during take-off and landing. The tray table is in the armrest, making the armrest immovable and slightly reducing seat width. There is no floor storage for this seat during take-off and landing. 20 H None No Power Seat 20 H has extra space due to the exit row. The proximity of the galley may be bothersome and people often congregate in this area during flight. The flight attendant seat is directly across from this seat and you'll have to share your foot space during take-off and landing. The tray table is in the armrest, making the armrest immovable and slightly reducing seat width. There is no floor storage for this seat during take-off and landing. 20 K None No Power Seat 20 K has extra space due to the exit row, though some of your legroom is impeded by the slide that protrudes from the exit door and you may have to angle your legs to fully stretch them. The proximity of the galley may be bothersome and people often congregate in this area during flight. The tray table is in the armrest, making the armrest immovable and slightly reducing seat width. There is no floor storage for this seat during takeoff and landing. 21 D None No Power Seat 21 D is an Economy bulkhead seat which may have slightly restricted legroom. Passengers may enjoy that there is no one in front of this seat. The proximity of the galley may be bothersome. The tray table is in the armrest, making the armrest immovable and slightly reducing seat width. There is no floor storage for during take-off and landing. This is also a bassinet location and passengers traveling with infants may be seated in this area. 21 E None No Power Seat 21 E is an Economy bulkhead seat which may have slightly restricted legroom. Passengers may enjoy that there is no one in front of this seat. The proximity of the galley may be bothersome. The tray table is in the armrest, making the armrest immovable and slightly reducing seat width. There is no floor storage for during take-off and landing. This is also a bassinet location and passengers traveling with infants may be seated in this area. 21 F None No Power Seat 21 F is an Economy bulkhead seat which may have slightly restricted legroom. Passengers may enjoy that there is no one in front of this seat. The proximity of the galley may be bothersome. The tray table is in the armrest, making the armrest immovable and slightly reducing seat width. There is no floor storage for during take-off and landing. 21 G None No Power Seat 21 G is an Economy bulkhead seat which may have slightly restricted legroom. Passengers may enjoy that there is no one in front of this seat. The proximity of the galley may be bothersome. The tray table is in the armrest, making the armrest immovable and slightly reducing seat width. There is no floor storage for during take-off and landing. 25 A None No Power Seat 25 A is a standard Economy class seat, however, this seat is missing a window. 25 K None No Power Seat 25 K is a standard Economy class seat, however, this seat is missing a window. 38 A None No Power Seat 38 A may have limited recline due to the wall behind and the proximity of the lavatories can be bothersome. 38 C None No Power Seat 38 C may have limited recline due to the wall behind and the proximity of the lavatories can be bothersome. 38 D None No Power Seat 38 D may have limited recline due to the wall behind and the proximity of the lavatories can be bothersome. 38 E None No Power Seat 38 E may have limited recline due to the wall behind and the proximity of the lavatories can be bothersome. 38 F None No Power Seat 38 F may have limited recline due to the wall behind and the proximity of the lavatories can be bothersome. 38 G None No Power Seat 38 G may have limited recline due to the wall behind and the proximity of the lavatories can be bothersome. 38 H None No Power Seat 38 H may have limited recline due to the wall behind and the proximity of the lavatories can be bothersome. 38 K None No Power Seat 38 K may have limited recline due to the wall behind and the proximity of the lavatories can be bothersome. 40 D None No Power Seat 40 D may have slightly limited legroom due to the position of the bulkhead. Passengers also enjoy that there is no one in front of this seat. The proximity of the lavatories may be bothersome and people often congregate in this area during flight. The tray table is in the armrest, making the armrest immovable and slightly reducing seat width. There is no floor storage for during take-off and landing. This is also a bassinet location and passengers traveling with infants may be seated in this area. 40 E None No Power Seat 40 E may have slightly limited legroom due to the position of the bulkhead. Passengers also enjoy that there is no one in front of this seat. The proximity of the lavatories may be bothersome and people often congregate in this area during flight. The tray table is in the armrest, making the armrest immovable and slightly reducing seat width. There is no floor storage for during take-off and landing. This is also a bassinet location and passengers traveling with infants may be seated in this area. 40 F None No Power Seat 40 F may have slightly limited legroom due to the position of the bulkhead. Passengers also enjoy that there is no one in front of this seat. The proximity of the lavatories may be bothersome and people often congregate in this area during flight. The tray table is in the armrest, making the armrest immovable and slightly reducing seat width. There is no floor storage for during take-off and landing. This is also a bassinet location and passengers traveling with infants may be seated in this area. 40 G None No Power Seat 40 G may have slightly limited legroom due to the position of the bulkhead. Passengers also enjoy that there is no one in front of this seat. The proximity of the lavatories may be bothersome and people often congregate in this area during flight. The tray table is in the armrest, making the armrest immovable and slightly reducing seat width. There is no floor storage for during take-off and landing. This is also a bassinet location and passengers traveling with infants may be seated in this area. 41 A None No Power Seat 41 A has extra space due to the exit row, though some of your legroom is impeded by the slide that protrudes from the exit door and you may have to angle your legs to fully stretch them. The proximity of the lavatories may be bothersome and people often congregate in this area during flight. The tray table and TV are in the armrest, making the armrest immovable and slightly reducing seat width. There is no floor storage for this seat during takeoff and landing. 41 C None No Power Seat 41 C has extra space due to the exit row, though some of your legroom is impeded by the slide that protrudes from the exit door and you may have to angle your legs to fully stretch them. The proximity of the lavatories may be bothersome and people often congregate in this area during flight. The tray table and TV are in the armrest, making the armrest immovable and slightly reducing seat width. There is no floor storage for this seat during takeoff and landing. 41 H None No Power Seat 41 H has extra space due to the exit row, though some of your legroom is impeded by the slide that protrudes from the exit door and you may have to angle your legs to fully stretch them. The proximity of the lavatories may be bothersome and people often congregate in this area during flight. The tray table and TV are in the armrest, making the armrest immovable and slightly reducing seat width. There is no floor storage for this seat during takeoff and landing. 41 K None No Power Seat 41 K has extra space due to the exit row, though some of your legroom is impeded by the slide that protrudes from the exit door and you may have to angle your legs to fully stretch them. The proximity of the lavatories may be bothersome and people often congregate in this area during flight. The tray table and TV are in the armrest, making the armrest immovable and slightly reducing seat width. There is no floor storage for this seat during takeoff and landing. 52 D None No Power Seat 52 D juts into the aisle and is often jumped from behind by service carts and other passengers. 52 G None No Power Seat 52 G juts into the aisle and is often jumped from behind by service carts and other passengers. 53 D None No Power Seat 53 D are a bit awkward because of the transition from four seats across to three seats across. While you have some extra storage space, you'll have to maneuver your legs around the extra seat anchors. 53 E None No Power Seat 53 E are a bit awkward because of the transition from four seats across to three seats across. While you have some extra storage space, you'll have to maneuver your legs around the extra seat anchors. 53 G None No Power Seat 53 G are a bit awkward because of the transition from four seats across to three seats across. While you have some extra storage space, you'll have to maneuver your legs around the extra seat anchors. 56 A None No Power Seat 56 A is in the last row of the aircraft and may have limited recline. Proximity to the galley may be bothersome. 56 C None No Power Seat 56 C is in the last row of the aircraft and may have limited recline. Proximity to the galley may be bothersome. 56 H None No Power Seat 56 H is in the last row of the aircraft and may have limited recline. Proximity to the galley may be bothersome. 56 K None No Power Seat 56 K is in the last row of the aircraft and may have limited recline. Proximity to the galley may be bothersome. 57 D None No Power Seat 57 D is in the last row of the aircraft and may have limited recline. Proximity to the galley may be bothersome. 57 E None No Power Seat 57 E is in the last row of the aircraft and may have limited recline. Proximity to the galley may be bothersome. 57 G None No Power Seat 57 G is in the last row of the aircraft and may have limited recline. Proximity to the galley may be bothersome. 6 A None No Power Seat 6 A is an angle lie-flat seat. Proximity to the bar and galley may be bothersome as passengers tend to congregate in this area. There is no floor storage during takeoff and landing. 6 C None No Power Seat 6 C is an angle lie-flat seat. Proximity to the bar and galley may be bothersome as passengers tend to congregate in this area. There is no floor storage during takeoff and landing. 6 D None No Power Seat 6 D is an angle lie-flat seat. Proximity to the bar and galley may be bothersome as passengers tend to congregate in this area. There is no floor storage during takeoff and landing. This is a bassinet location, so passengers traveling with infants may be seated in this area. 6 G None No Power Seat 6 G is an angle lie-flat seat. Proximity to the lavatory and galley may be bothersome as passengers tend to congregate in this area. There is no floor storage during takeoff and landing. This is a bassinet location, so passengers traveling with infants may be seated in this area. 6 H None No Power Seat 6 H is an angle lie-flat seat. Proximity to the lavatory and galley may be bothersome as passengers tend to congregate in this area. There is no floor storage during takeoff and landing. 6 K None No Power Seat 6 K is an angle lie-flat seat. Proximity to the lavatory and galley may be bothersome as passengers tend to congregate in this area. There is no floor storage during takeoff and landing. 7 A None No Power Seat 7 A is a standard angle lie-flat seat. 7 C None No Power Seat 7 C is a standard angle lie-flat seat. 7 D None No Power Seat 7 D is a standard angle lie-flat seat. 7 G None No Power Seat 7 G is a standard angle lie-flat seat. 7 H None No Power Seat 7 H is a standard angle lie-flat seat. 7 K None No Power Seat 7 K is a standard angle lie-flat seat. 8 A None No Power Seat 8 A is a standard angle lie-flat seat. 8 C None No Power Seat 8 C is a standard angle lie-flat seat. 8 D None No Power Seat 8 D is a standard angle lie-flat seat. 8 G None No Power Seat 8 G is a standard angle lie-flat seat. 8 H None No Power Seat 8 H is a standard angle lie-flat seat. 8 K None No Power Seat 8 K is a standard angle lie-flat seat. 9 A None No Power Seat 9 A is a standard angle lie-flat seat. 9 C None No Power Seat 9 C is a standard angle lie-flat seat. 9 D None No Power Seat 9 D is a standard angle lie-flat seat. 9 G None No Power Seat 9 G is a standard angle lie-flat seat. 9 H None No Power Seat 9 H is a standard angle lie-flat seat. 9 K None No Power Seat 9 K is a standard angle lie-flat seat. All seats in this aircraft are equipped with a 110-volt power outlet. EVA Air's A330-300 aircraft seats 309 passengers in a two-class configuration: Premium Laurel and Economy. EVA Air is slipping on this seat arrangement- Economy seats are the usual crunched together similar to United, so at 6'2" I cannot sit normally and knees are into the next seat. But to make it worse, the dumb seat design slides the lower cushion forward when reclining the back. Yep, my knees have no place to go so recline does not work. I hope they retrofit all seats designed like this, AND do the EVA thing of giving a tad more knew room. Not everyone is 5' tall! Flew short 2 hour flight from HKG to TPE. This seat is comfortable for a short flight, but would not work for me at 6'2" on long-haul in fully reclined position. It is a bit short compared to 777 Royal Laurel, but worse yet, the space for your feet narrows down to nothing, so legs must be bent in lay flat position, and your feet tend to wedge against each other. Really dumb engineering! Food was good, and EVA Air service was stellar- I fly EVA for every Asia trip, as there is no comparison with US airlines. 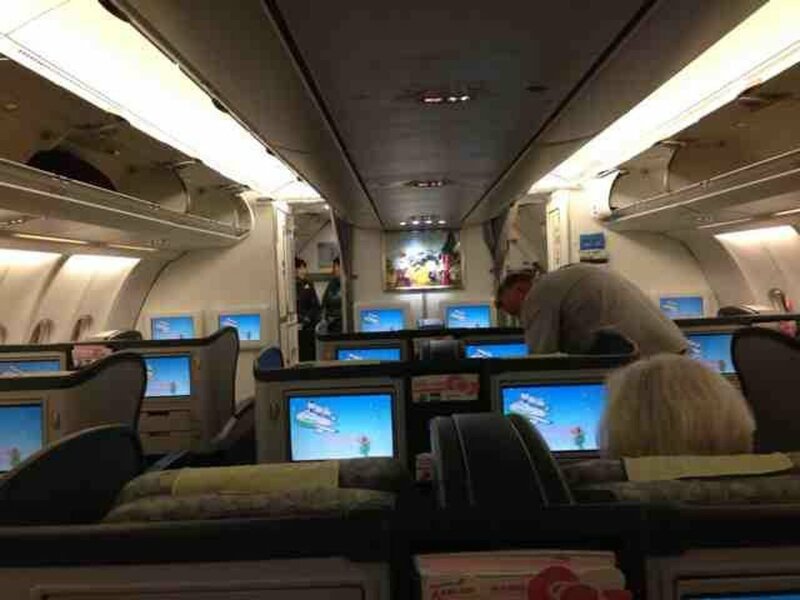 But the seat arrangement of the A330 needs improvement! Seats 20 and 41 C and H should be avoided by larger pax due to a remote control that protrudes deep into the seat space. It is literally not possible foor a big person to sit there. The window seats in those rows are very good with no problems from the slide box. Flight attendant seat straight ahead is no problem, the distance is wide. Seat still has AVOD that extends from armrest, but I think the review should note that the AVOD screen must be put away for taxi, takeoff, and landing, just like the tray table. Everyone else gets to start or finish a movie for the first 20 and last 20 minutes of a flight, or during extended traffic control wait for takeoff clearance, but not in these exit row seats. 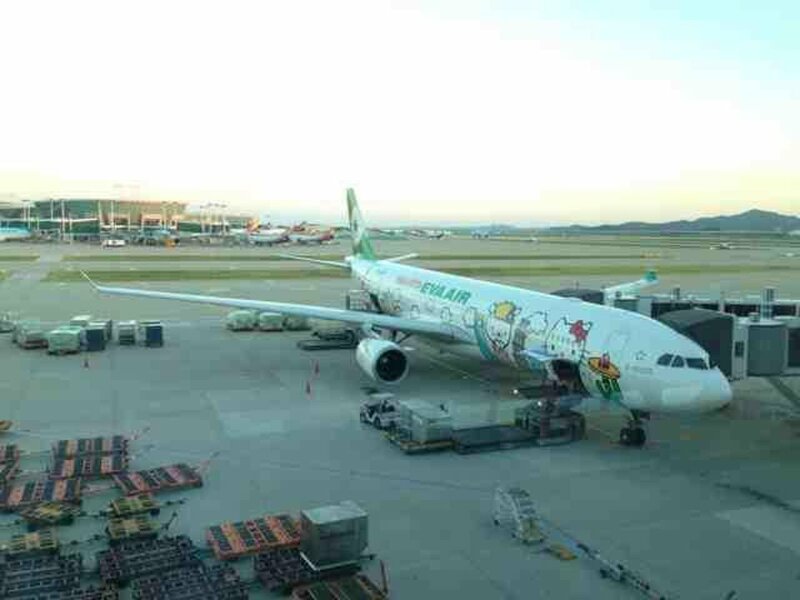 EVA Air flies 1 versions of Airbus A330-300.